Aside from one brief and (mostly) sarcastic tweet last week, I’ve managed to keep RobBellgate (hellgate?) at arm’s length since the tweet heard round the world. I consider this quite a feat since a) I am slow neither to have an opinion nor to share it, and b) I have been asked about this roughly 133 times a day for the last month. It’s not that I don’t believe this is an important conversation. I do. I’m just slower than I once was to give my time and energy to trending issues that don’t occupy my more immediate sphere. Mostly that’s because I’m older, slower, and busier than ever. Hopefully it’s also because I’m at least a little wiser. Let’s say it’s that, just for fun. In this case, I also wanted some time to sift through what was happening. The tension and angst was immediate and palpable, and I didn’t think it wise for me to start spewing opinions, especially on the interwebs. So I didn’t, and I’m glad. I suspect many on all “sides” have said and written things in recent weeks they ultimately will regret, and I’ve been that guy, well, a lot. Sadly, that takes some of the fun out of throwing of rocks at those who react too quickly or too strongly. Mostly I hope to continue growing up in that area and to maybe help others do the same. Even now, I don’t presume that my perspective is particularly original. I imagine others have said all or most of what I’ll write here in one way or another, but I don’t have time to read the whole internet to find out. I hope so. I hope I don’t find myself in a corner occupied by only me and one or two other dorks. But if I do, I’ve been in that corner before, so we’ll find something nerdy to do there and everyone else can go to a hookah bar or whatever it is freed-up non-dorky Christians do when I’m not around. On to what you’re here for – watching me sort out this whole mess. Bad news. This is not a review of Love Wins. The book is important. It is. I’ll get there. Until then, I am particularly interested in the way we are talking and writing about the book. I am most concerned by what I perceive to be a rapidly diminishing capacity for grace and charity among professing Christians. This strikes me as a tragic spiritual descent expedited by our largely undiscerning use of the internet in our quest to be heard. In the furor over Bell’s new book, I’ve observed that to be true at two levels – personal/communal and theological/intellectual. But I’ll come back to that. Let me first describe what I feel like I’ve witnessed, acknowledging that my perspective is limited…caveat emptor and all that. Shortly after Bell’s publisher released a marketing blurb and a video of Bell himself promoting the book, the internet melted. By that I mean everyone began sounding off on whether or not Bell was a heretic. It ran the full gamut of detractors to defenders, some obviously poised and waiting for Bell to finally “out” himself as a universalist, others taken off guard by either Bell or the immediate firestorm. It was nuts. Really. I’ll be honest. I didn’t care for the level of judgment that was issued publicly before the book was in people’s hands. For one thing, the written description of the book was almost certainly penned by some unknown marketing dweeb sixteen levels deep on the publisher’s organizational chart. I know because I spent years as that unknown dweeb. That’s how it works. So to be honest, I felt a little embarrassed for those dissecting those words. It’s completely fair to offer a critique of the publishing business and suggest that authors are ultimately responsible for how their work is sold. In fact, remind me to write about that someday. I’m just saying – whatever the book ultimately contained, it was not terribly productive to spend time on a preemptive exegesis of the ad copy. There also was plenty of electricity from the video. Fair enough. It was Bell doing his usual routine, walking in the snow asking provocative questions and poking at the viewers’ perceptions of the obvious. I agree it is relatively clear from the video that Bell’s book was likely to go down some paths that do not represent the most common view of orthodoxy when it comes to the nature of salvation, time, and eternity. What was not clear from three minutes of video footage was Bell’s actual doctrine of salvation, time, and eternity. Consequently, I don’t think it was fair to conclude from that brief video that Bell was, in fact, off the reservation completely. I’ll come back to that too (in part two, which is forthcoming), because I know not everyone agrees. My discomfort with the initial responses is not rooted in a soft-bellied, “why can’t we all just get along?” standard of Christian discourse. I didn’t expect silence, and it was completely fair for folks to express their concerns about what they could see and hear at that time. Some did just that. Terrific. Others, however, used their sizable platforms to make conclusive statements about Bell and the book that were both premature and uncharitable. Even if the book ultimately demonstrates that they guessed right, I find no compelling biblical basis for that mode of operation. I just don’t. Charity aside, what seems wise or particularly discerning about drawing public conclusions about a book and its author before you’ve read one. single. word. of. the. book? This is not Piper. Just the gear needed to read Future Grace. Some version of the response I’m alluding to was fairly widespread, particularly among well known reformed evangelicals (a description that fits many of my friends, whom I sincerely love and respect). But one response in particular really pained me. John Piper, who I admire, posted the following on Twitter: “Farewell Rob Bell.” It was followed by a link to the most popular blog post critiquing the ad and video. 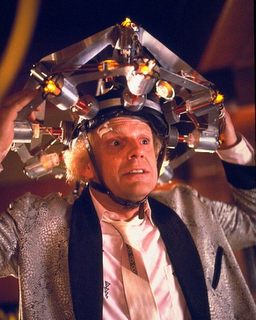 Three words from a man who writes books so long and dense that the smartest people I know need decoder rings and that helmet Doc Brown was wearing in 1955 to sort of understand them. Piper is brilliant. He’s easily one of the best preachers I’ve ever heard. His passion for God and for reaching the world is contagious. And he was wrong. He bid Bell “farewell” based on what? 128 words of ad copy and a three minute promotional video? If once upon a time you had told me that John Piper would find a way to embody my deepest suspicions of social media – drive-by reductionism – I would have laughed. But he did. And I just don’t get it. Look, I understand Bell was not an unknown entity to Piper or the others drawing the same conclusions. I know that the publishing of this book – even before the book itself was in their hands – seemed to them likely confirmation of their long-held suspicions that Bell was a wolf wearing wool. I don’t dismiss the clear biblical call for those appointed to lead the church to guard the flock and contend for the faith. Ultimately, whether or not I agree with them or with Bell, I’m not offended that Piper or anyone else would conclude that Rob Bell has left what they consider the domain of Christian orthodoxy. I just hoped – and still hope – we find wiser, more loving ways to go about arriving at those conclusions and then communicating them publicly. What grew around Piper’s “farewell” and similar words from others often wasn’t pretty. Many Bell supporters reacted with equally disappointing disdain for his critics, and the scrums have been many and bloody. It’s gross. I hate it. I hate it. No one wins those fights. No one. We have much to repent of and grow into in the realm of loving, gracious dialogue at a personal and communal level. Parts Two (now here) and (probably) Three coming soon: the rules of orthodoxy, other heretics, and the demands of honesty and love. Have you discovered if Benny Hinn has weighed in on this topic? WWBHSay? Hmm. Benny would say, “Touch!” Duh.